Chef Hung Huynh joined Kathie Lee and Hoda to share his amazingly delicious recipe for chicken lettuce wraps with a honey soy glaze. Hung Huynh is the chef at The General restaurant in New York City and the lettuce wraps are a featured item there. Kathie Lee shared that garlic is one of the most important ingredients in Chinese cooking. 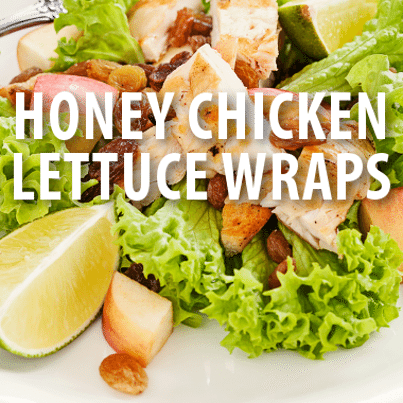 Bibb lettuce is used because it makes it much easier to create a wrap. The great thing about the wraps is that you can pretty much add whatever toppings you want. I would totally fill mine with avocado and carrots. The glaze adds sweetness and a bit of tang. I love how simple, healthy, and refreshing this recipe is. I’ve made a similar recipe to this before, but the simple lettuce wrap recipe is given a great kick with the honey soy glaze. I like how this recipe is a great way to incorporate vegetables into a meal without really feeling like you’re eating vegetables. I think this is a recipe that would even go over well with kids. If you’re looking for a healthy, easy to make meal to cook for your family, this is definitely it. Cut cooked chicken into strips. Put chicken, avocado, scallions and carrots into the center of a slice of lettuce. Dip into the glaze and devour. Put the soy sauce, orange juice, honey and garlic in a sauce pan. Let simmer until the mixture reduces by 1/3. Mix the water and cornstarch together in a separate bowl to make a paste. Add the paste to the glaze to thicken it up.